Where I’m at in the series: Finished it. Albert is a young man of privilege in Paris, but the trappings of his aristocratic birth leave him bored and unsatisfied. Seeking adventure, Albert’s restless spirit leads him to a festival on the moon – and to the Count of Monte Cristo. An enigmatic man of charm and wealth, the Count of Monte Cristo’s charisma and sophistication captivate Albert. The fascinated youth invites the nobleman to mingle within the upper echelons of Parisian society, and the Count is soon courting the favor of France’s most powerful families. Little does Albert know, as his new friend walks the ornate halls of the highest class, the Count of Monte Cristo wants only to bring them crashing down through vengeance. 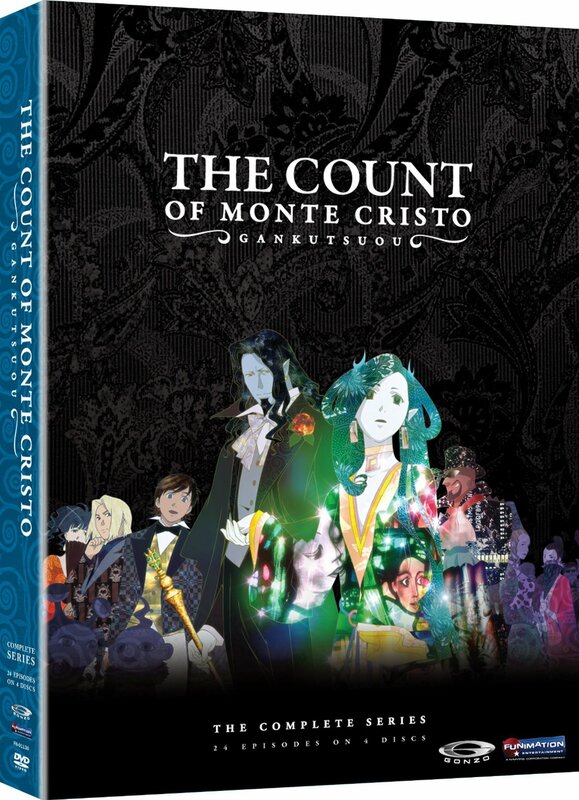 Warning: This review will contain spoilers for the entire anime series, as well as for the novel The Count of Monte Cristo by Alexandre Dumas, and the 2002 movie The Count of Monte Cristo . I have not read the Gankutsuou manga. Plot & Pacing: If you’re familiar with the original novel, and the 2002 movie adaptation, the beginning of the anime throws you for a loop – because it puts you in the plot at a point that is almost the end of the novel. The first couple of episodes are full of action, even if it takes you a while to get through the action. And then we slow down for several episodes, and then everything happens and keeps happening. So, I felt the pacing was a little odd at points, but once it picked up, it stayed picked-up. The plot itself was, of course, familiar. I’ve read the novel, and I’ve seen the 2002 movie. It had enough changes to make you pay attention, though. And some of the changes I liked, some of them I didn’t. What I really and truly appreciated, though, was they didn’t pull the little twist that the 2002 movie did, where Albert ended up being Edmond’s son. In the book – and in Gankutsuou, Albert was truly Fernand’s son, and all the credit for his upbringing firmly belongs to Mercedes. Because Albert is, fortunately, nothing like his father. Also, you will need a box of tissues for episodes 17, 18, and 19. I rarely cry at shows & movies, and I was about bawling when I realized what was happening in these. I was sad, though, because this did not have a happy-ish ending like the novel did. The Count dies in the end, and Heidi (novel spelling, not anime spelling, because it was dumb) is left alone, despite having fallen for the Count long ago. Also, if you want to read a really good, in-depth review, I recommend this one on Amazon by Aion. Casting: I’ve been watching enough anime lately that I’ve actually started being able to pick out voice actors (at least in English dubs). I can’t say that I’d actually heard any of the voice actors in Gankutsuou before, but it is also an older anime (aired in Japan initially from 2004-2005, released in the US in 2007). Overall, though, I felt each voice actor did a very good job for the character they portrayed. Favorite Episode: Haven’t completely decided yet. Would I watch it again: Yes. In fact, I feel I need to watch it again just to pick up all the little things that happen in it that create the larger completion, because it has so much depth.